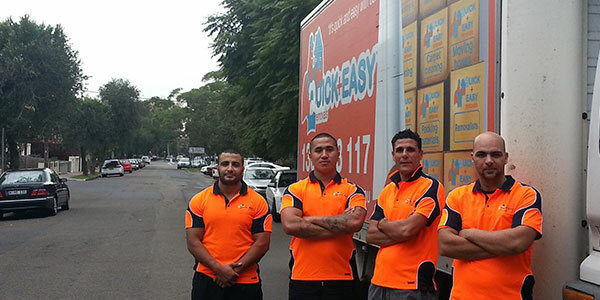 Quick & Easy Removals offers moves anywhere from Sydney to Melbourne to Brisbane with the same top quality service. If you are looking for an affordable furniture removal business that provides an outstanding reliable interstate relocation service, then Quick and Easy Removals are the answer for you. We are skilled and practised interstate removalists and regularly move Sydney households and companies from Sydney to Brisbane, Sydney to Melbourne and Sydney to Adelaide etc. We also relocate families and organisations to Sydney such as Melbourne to Sydney, Canberra to Sydney, and Sunshine Coast to Sydney etc. Your goods are our priority so Quick & Easy Removals only carries one job per truck which ensures there are no double ups, mix ups, and your goods are delivered quickly as possible. At Quick & Easy Removals we strap down all items in the truck so during transit they are properly secured and carefully packed. We also care for our drivers and vehicles on the roads; our removalists are experts at long haul driving and know the distance roads like the back of their hands, so when they arrive on your doorstep they are on time and in good humour with your furniture and goods in perfect condition. For your peace of mind, we usually charge a fixed price for interstate moves. Therefore, you don’t have to worry about the time spent on the way or time spent in inspection points etc. Our interstate moving prices are very competitive. Please use our Need a Quote form and we will contact you very shortly with a quote for your move to another state in Australia. Depending on the distance of your move we can load up and unload on the same day or unload the next day. It is not often that a job takes us more than two days but does depend on the distance travelled. When moving interstate is it often a logistic challenge to find the time to do a comprehensive clean of your vacated home or commercial premise. Once you have cleaned your home for example, what are you going to do with all the cleaning equipment? If you are driving interstate you might be able to squish them in your already fully packed car. However if you are flying interstate then my guess is that you don’t want to take the vacuum cleaner and mop with you. To make life simple for you we at Quick and Easy Removals offer an expert cleaning service. As for our removal service we provide a high standard at an economical rate. When goods are transported a long distance such as an interstate move not all roads are in good condition and there are more than likely going to be some fairly poor drivers on the road as well. Thus your furniture removal vehicle may have to stop abruptly or bounce through potholes in the road. In order to best protect your possessions we highly recommend that you engage our skilled packing service as well. This could in fact save you money. If you have a valuable item that has not been provided the best protection with bubble wrap and corrugated cardboard etc and skilled packing, there may be breakages through no fault of our drivers or movers. Replacement or repair of this item could well be more than the total packing cost with Quick and Easy. We provide all our boxes for interstate relocations for free. For maximum of ease you could plan to unpack the boxes whilst the removalists move in your furniture items. Then you could provide the boxes to the removalists and you are already well down the road to settling in. Call 1300 883 117 to let Quick & Easy Removals take the worry of interstate moving away and provide you with long haul expert care. Moving Interstate with Quick and Easy Removals? You can be certain your interstate move will be successful and stress free. Call (02) 8599 2235 to let Quick & Easy Removals take the worry of interstate moving away and provide you with long haul expert care.